With every trip I make to Italy, I bring back more treasured memories of the warm and endearing hospitality of its people. In fact, not only do I keep a ‘diary’ of sorts by writing my articles for Timeless Italy, but I seek out ways at home to keep this Italian way of life vibrantly alive on a daily basis. One activity I have recently taken up has been to join a book club of Italy lovers like myself. Between us all, we keep Italy alive and well in our hearts and minds as we enjoy a monthly Italian lunch of prosecco, salad, main dish and tiramisu while discussing our latest book choice. At our last book luncheon, we were accompanied by a journalist for the Lake Oswego Review. Here he shares his observations of our lively group at Nicoletta’s Table. Although the group looks to me as the “Italy expert,” I can honestly say they are just as knowledgable and have shared their incredible Italian journeys as well. Enjoy…. The only bad thing about the Nicoletta’s Table Book Club is that their room isn’t big enough. It can barely contain the members of the club and their high spirits. For ladies who love Italy and can’t get enough of it, the Nicoletta’s Table Book Club is just the place to go. That is if you can get a seat at the table….. When good food and good company come together, the result is magic. Especially with Italian food. The club is also about the love of Nicoletta’s Table owner Shari Newman. Having a book club was her idea in the first place, and since so many people love Newman’s restaurant, Greer thought it was a great idea. Even though she had to shrug off some early discouragement. Of course, she was right. Greer is now surrounded by happy Italophiles, all of them ready to enrich their Italian experience. They even discuss books about Italy. The tome reviewed at the most recent meeting was “An Italian Journey” by James Ernest Shaw. The discussion is loud, witty and the laughter rolls. Observations are pungent: “When you marry an Italian, you marry his mother.” What the women liked most about the book is its description of how close Italian families are, living in one city and one neighborhood for decades, maybe centuries. This remarkable strength of community is something they envy. Almost all of the club members have traveled to Italy and could probably write a pretty good book about their adventures. But when it comes to knowledge of Italy, the club looks to “our expert” — Susan Nelson. Her great Italian experience started 13 years ago on a quick two-week vacation that covered three countries — France, Italy and Switzerland. Once under the spell, Nelson kept going back. Now she travels to Italy once or twice a year and has written 200 blog articles about her experiences and discoveries. Her best discovery has been new friends. 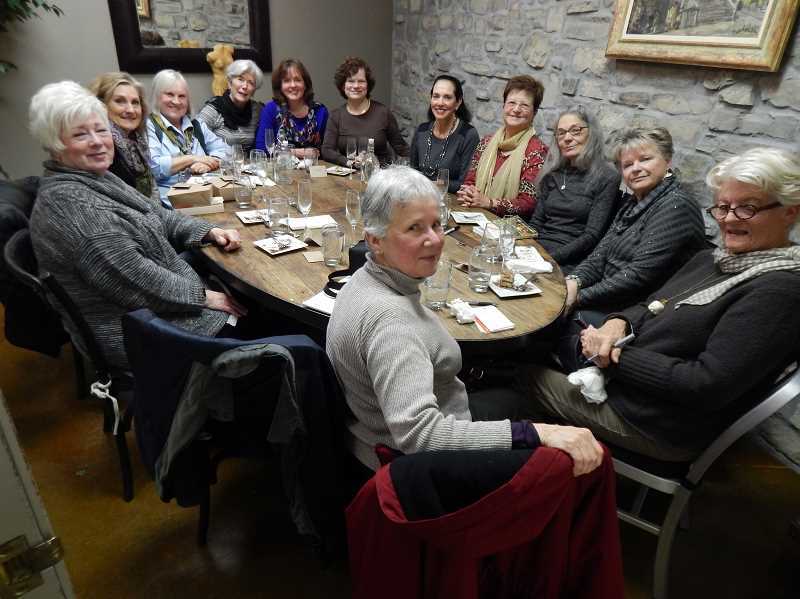 Having a person like Susan Nelson around is a valuable asset for the book club, and the club, with its “wonderful group of ladies” helps Nelson ease her craving for all things Italian. Certainly it will help to have Nelson’s expertise when the club has its dream come true: a trip to Italy by all of the members of the Nicoletta’s Table Book Club. I hope you enjoyed this review and that you have thought of ways to keep Italy alive in you own world, wherever that may be. ITs a great idea; I live near Palo Alto CA and wonder if there are group members here who would like to try something similar? I’m sure we can find a good Italian restaurant that has a room and would love to have a group like this have a monthly meeting. Ciao Ray, i’m sure you are right. The lady who started this one said that at the first meeting, she was the only one! But its now been 4 months and we had to stop at 16:) I hope you do start one! Great family pic in such a rustic-looking locale. This is our regular meeting place in the restaurant. It’s perfect for us as we don’t have to compete with the background noise. This post touched my heart. I completely agree with you about the warm hospitality of the Italians. I always feel so loved when I’m there! What a fantastic idea to gather with a group of Italophiles. Can you share a list of some of the books your club has read? Hi Stacey, thank you do much! Yes, I do have a few books…however, I have been with the group for only a few months so it is short now. Beside the one mentioned in my article, we have read Eating Rome, by Elizabeth Minchili. For Dec. we are not reading a book but just gathering to share our wonderful memories of Italy and toast to the holidays. I will make a point to include book reviews on my blog so you can stay updated. Wish you lived closer, Stacy, so you could join us! Oh me too, I would love to join you if I lived closer! Instead, I will look forward to your book reviews! I agree with Lyn…love the idea…wish we all lived closer or why not a virtual book club of Italy-lovers? I do a book club with my sisters and we are all over the place….sometimes we do a skype visit…it is fun. Or also a whatsapp group chat…..it obviously cannot replace all getting together in the flesh…it still makes for fun chats. I’ve considered a virtual book group! I think it’s a fantastic idea to bring friends together from different parts of the map. Of course, a bit of vino and cheese always makes the meeting that much more fun:) Thanks for checking in, Diana!